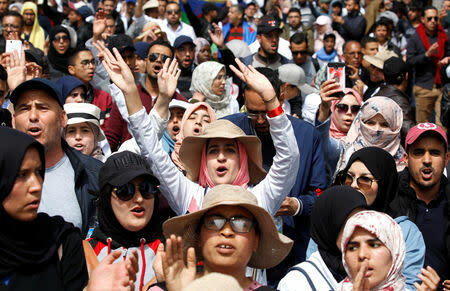 RABAT (Reuters) - About 10,000 teachers staged a new protest in the Moroccan capital Rabat on Sunday to demand permanent jobs, hours after police had used water cannon to disperse an overnight demonstration. They want an end to renewable contracts in favor of permanent jobs that offer civil service benefits, including a better retirement pension. The protest was organized by an alliance of leftist opposition parties, main unions, civil society organizations and university students. The teachers have been striking for three weeks in a row. "We are not intimidated by the threats of the education ministry's because we came to claim our right to be integrated in the civil service and defend the public school," Abdelilah Taloua, a young teacher, told Reuters. We found 85,000 cops who've been investigated for misconduct. Now you can read their records.